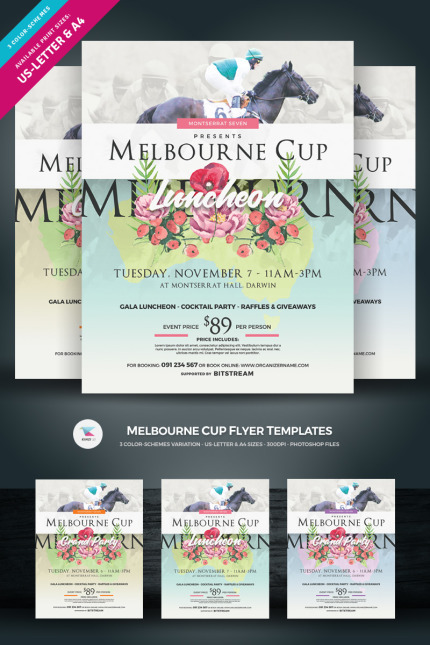 A flyer template designed for this-November sporting event: Melbourne Cup. You will get 3 color-scheme-options templates and 2 print-sizes (US-letter and A4). All elements of design are included but if you would like to add this template with your images or photos, that is possible. This flyer template is fully-editable with just clicks of mouse. You can replace the sample texts with your information and even you can change the color-scheme of the design. Please note that you need to have Adobe Photoshop CS2 or later version to open and edit the template files.